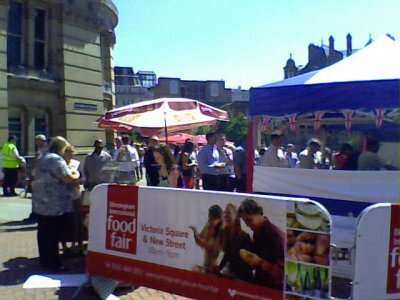 Heading down to Victoria Square for the First ever Birmingham International Food Fair. The weather this week is amazing. It’s sunny and in the mid-20s Celsius. Shockingly, this is the first week of Wimbledon, which most Brits swear to me is a sure indication that it is going to rain. I went to Wimbledon last year, and it didn’t rain on me either, though, so perhaps it is just the strange obsession that British people seem to have with claiming English weather is always cold and rainy every summer, even while the sun is shining and people are wearing shorts and sunscreen. 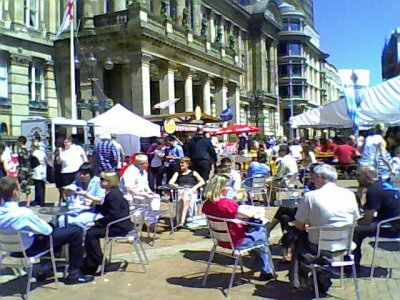 The sunny weather is not only a windfall for Wimbledon’s little lawn tennis contest, but it also comes the same week the Birmingham is hosting their first ever International Food Fair. 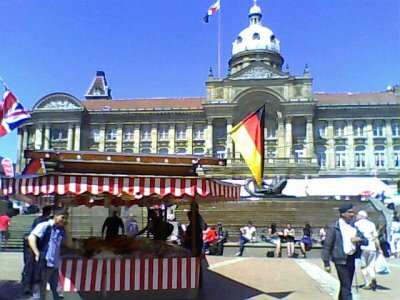 The food fair, sponsored by a local radio station, offers “visitors a culinary tour of the world right in the heart of the city,” according to the Birmingham City Council’s website. 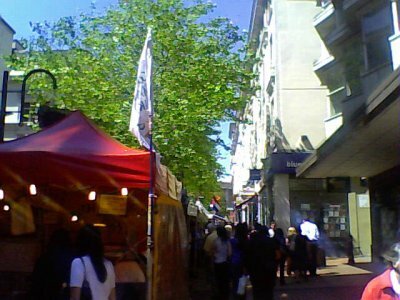 There are over 60 stalls offering cooked food, market stalls and drinks from England and abroad. There is a small stage which hosts local artists to entertain the crowds. 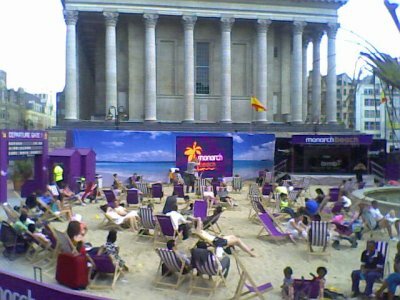 Monarch, the tour company, also created a beach nearby. 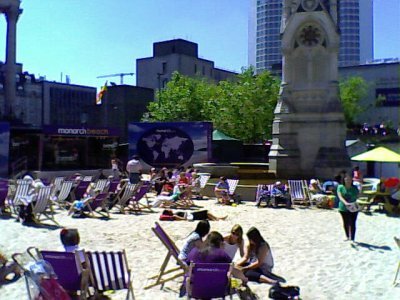 A little touch of the Costa del Sol, right here in Birmingham, about as far from any beach as you can get in the UK. Tuesday evening myself and a few coworkers went to the fair to try Hogan’s Cider. Hogan’s is one of the more local of the international offerings, being as they are from Warwickshire, just 40 minutes down the road from Birmingham. When the weather is warm and sunny, a cool apple cider is always an excellent drink choice. 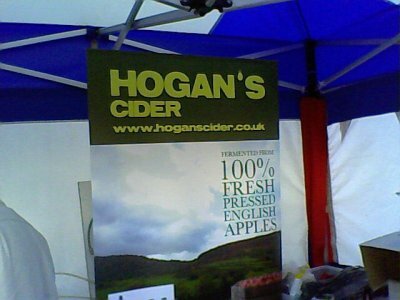 The cider from Hogan’s was very good, sweet with a touch of tartness without being acidic. I’ve often found with cider that the acid means that after a couple I can’t drink anymore for fear of developing heartburn, but not with the Hogan’s. Many a pint was consumed by our little band of drinkers. 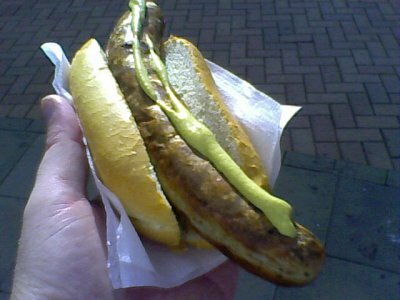 To line the stomach a little bit, I went a touch more international than Warwickshire, and got a nice German bratwurst. Today I wandered down for lunch, and ended up grabbing a couple of burgers from the “Meats of the World” stand. The name alone was enough to attract me, given my love of both Meat and The World, but it was the menu that really drew me in. 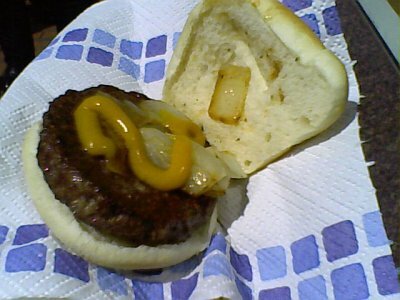 I started with a Springbok burger. The springbok is a South African antelope known for its jumping abilities, used both to attract a mate and to make hasty escapes from danger. The springbok is the national animal of South Africa, and the nickname of the South African national rugby team. The British and Irish Lions, the national Rugby team of the UK, is currently down in South Africa taking on the rugby Springboks, so I figured that eating a springbok burger would some how indicate support for my adopted nation’s rugby players. The springbok is also the symbol of the Royal Canadian Dragoons from Petawawa, Ontario. During the Second Boer War in the late 1800s/early 1900s, The Dragoons were camped in a field. A Boer force attempted to launch a sneak-attack on the Canadians, but the Boers’ movements startled the nearby springboks. The leaping antelopes raised the concern of the Canadian commander, who ordered his forces to the ready. The Canadians, alert and ready for the attack, were able to defeat the Boers, and thus they adopted the springbok as their mascot. So not only am I supporting the Irish and British Lions rugby team of England, but also supporting the Canadian forces. Supporting both the country of my birth and the country where I live. Sweet. 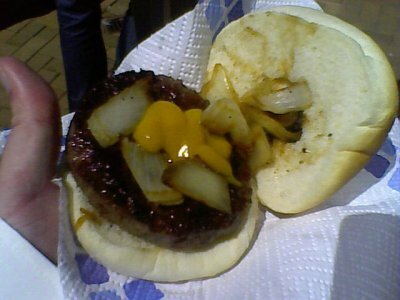 Back to the burger, the springbok was quite lean and dense, drier and less greasy than a burger made from cows. It was very tasty. Having made the culinary journey to Africa, I decided to stay in the southern hemisphere and have an Australian offering next, a kangaroo burger. I don’t really have an interesting coincidence or analogy to offer here, other than the fact that England is playing Australia in The Ashes in July and August. The Ashes is a cricket match played every two years between the two countries. The Aussies’ don’t call their cricket team the kangaroos, but we can consider my consumption of the burger some sort of support for the English cricket team, I think. Kangaroo was tangier and slightly greasier than the springbok, but still leaner, drier and less greasy than a cow burger. 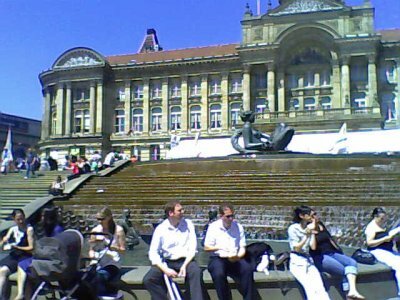 I sat and ate my burgers in the glorious sunshine of Victoria Square. 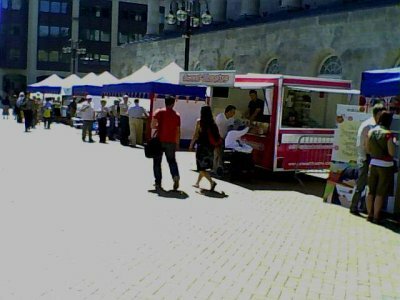 Victoria Square is usually a pretty square surrounded by imposing Victorian buildings, but with the food stalls and beer tent the square had been transformed into a lively piazza, like the restaurant lined squares of an Italian village, giving an international flair to Birmingham’s international fair. 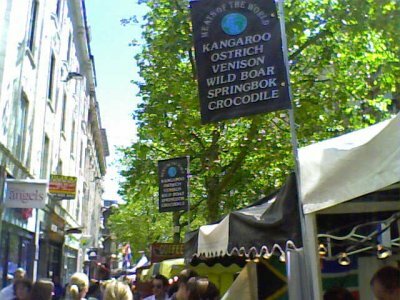 As I ate my springbok sitting on the side of the square’s fountain, I could almost imagine myself sitting on the banks of the Vaal River, eating a springbok burger while watching live springboks hop across the landscape. Chowing down on my kanga-burger, I pictured lunching at Uluru and munching down on a kanga-burger in the hot, Australian sun. 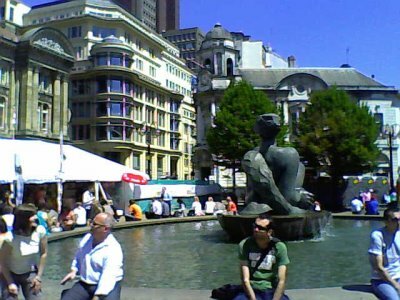 After eating my burgers in the glorious sunshine, I headed away from the square, each step taking me away from the fantasy global food village and into work-a-day reality. I may not have really gotten away to Australia or South Africa, but at least I got a quick lunch-time international culinary trip.